I generally like my coffee black. Rare are the times I crave something creamy like a latte or cappuccino. However, I do enjoy a refreshing iced coffee when the weather calls for it. Ever since I first heard about Kori Coffee, a Japanese iced coffee drink, I knew I had to give it a try. Coffee is used to make the ice cubes instead of water, so the drink never becomes watered down. The cubes slowly melt in the warm milk, releasing the coffee as you sip. I also added cocoa powder to satisfy my morning sweet tooth! Start by brewing some coffee. 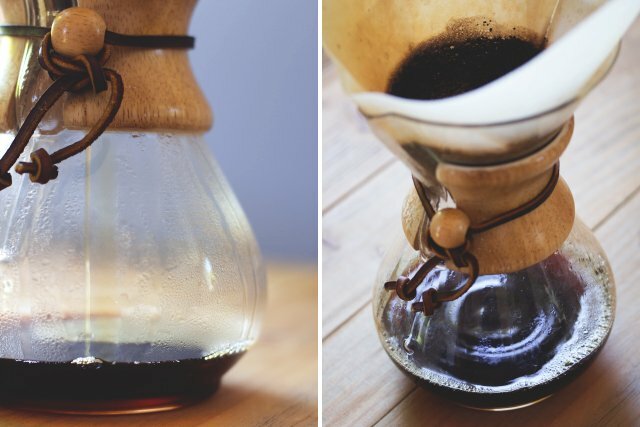 I like to use my Chemex to make a large pot of drip. 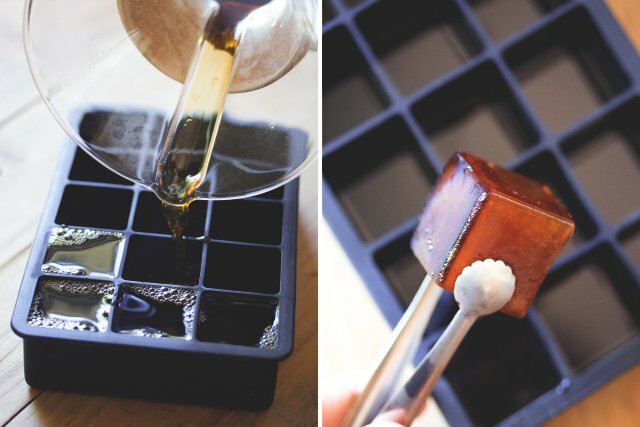 Let coffee cool a bit and pour into the ice tray. For this recipe, fill at least six 1-ounce cubes. Let ice set in the freezer. 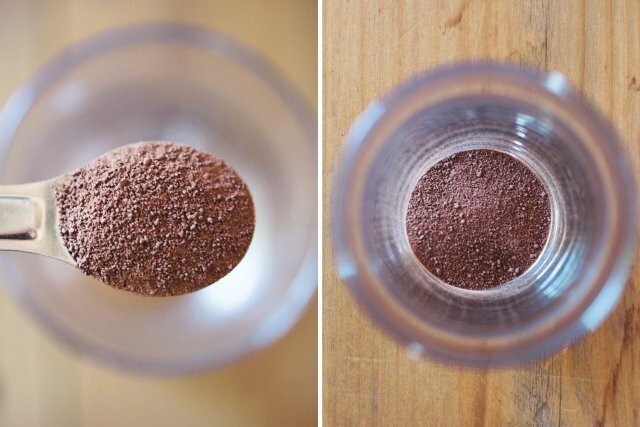 Once your coffee cubes are frozen (I let them set overnight) add cocoa powder to the bottom of your glass. 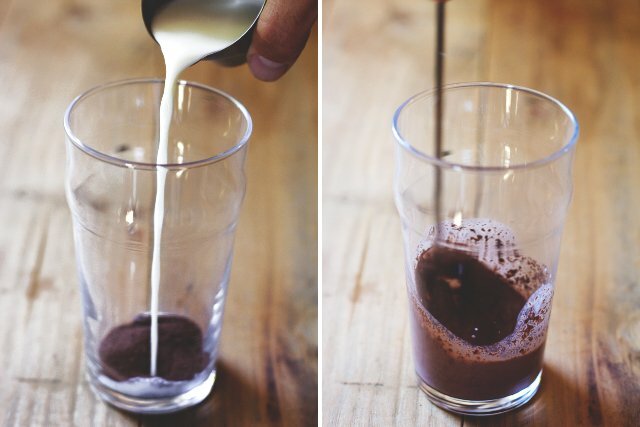 Warm the milk and pour two ounces into the glass with the cocoa powder and stir until completely dissolved. 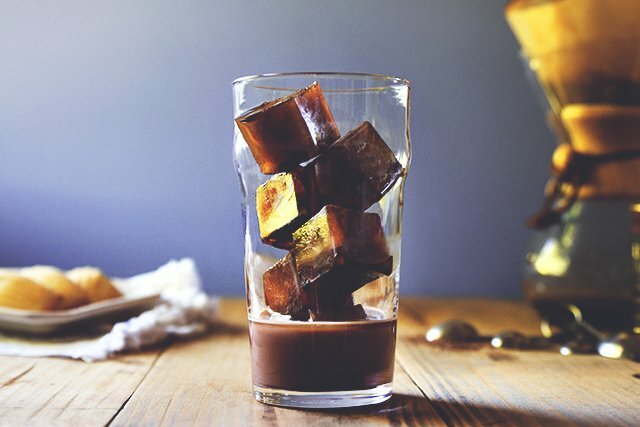 Next, fill your glass with coffee ice cubes. I used six cubes, for approximately six ounces of coffee. Feel free to adjust the amount of cubes if you want more or less coffee flavor. Finally, add the remaining milk and stir. 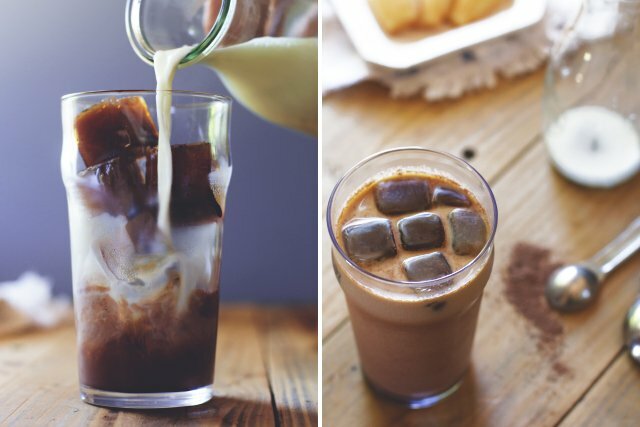 The warm milk will slowly melt the coffee ice cubes, leaving you with an exceptionally refreshing morning treat. Have to say the article was amazing. 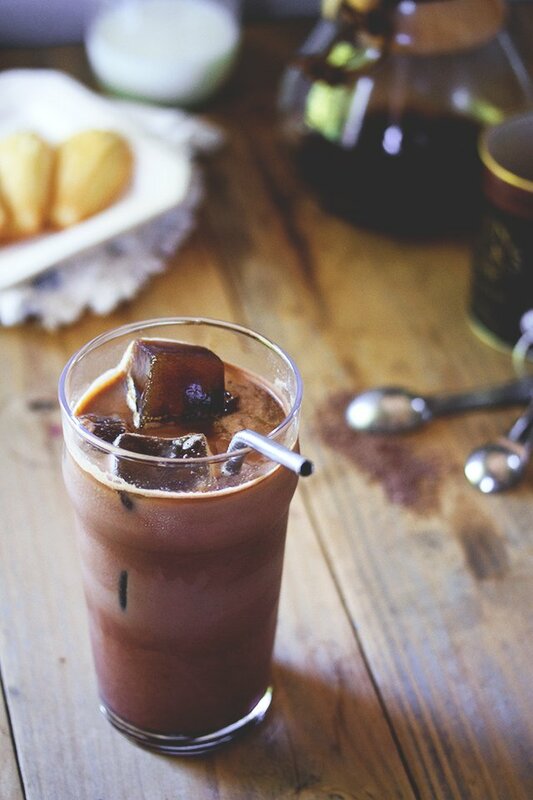 You did write a great guide here and its the perfect one to follow to make an amazing iced mocha coffee. The images are awesome. LAS RECETAS LUCEN RIQUISIMAS! Las practicare cada vez que tenga un tiempito y me vengan visitas. GRACIAS! I can’t wait to make this tomorrow morning. Wish I had seen this earlier my ice cubes would have been done all ready.Can you add a flavor creamer when you add the cocoa. Sipping this now, yum! Added a packet of stevia for some sweetness! 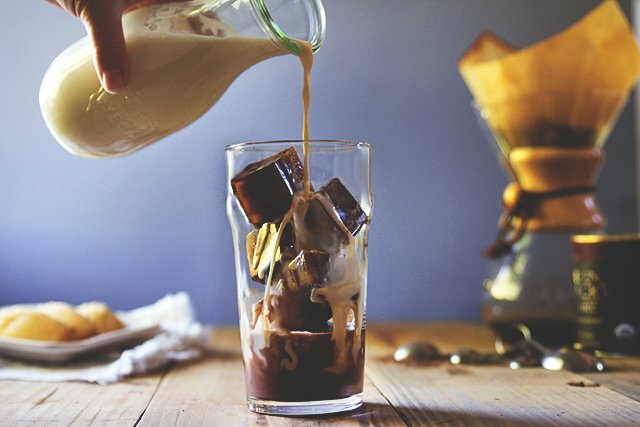 Yum yum…i had imagined trying this a few days ago..but my idea was to freeze coffee with milk…ur idea seems definitely awesome..can’t wait to give it a try!! Just brewed the coffee and waiting for it cool off then to freezer. Hopefully a delicious coffee treat awaits for me tomorrow morning! I’ve been trying to crack the code of a good iced coffee with minimal effort for years. This will definitely become a summer staple for me! My only regret is I found it so late in the summer! Aww, thanks Caroline. Glad you found us!! Did you have any difficulty removing the coffee cubes from the tray? I found it was harder than when I use water, enough to break my ice cube tray in two when trying to twist it! The cubes just wouldn’t come out…Maybe I’ll try letting it sit outside for a few minutes before trying to get the cubes out next time. Hi Marie-Eve, sorry about your ice cube tray! Hmm…I didn’t notice much of a difference, but maybe that’s because I used a silicone tray. The cubes were a bit syrupy, so I can totally see how they could stick. I’d say with a plastic tray let them sit for a minute or two like you said, or run the bottom of the tray under a bit of lukewarm water for a few seconds. Omg. I want this right now!! I have been drinking this for the past 2 days and I might have an addiction. Tried it this morning-delicious. Thanks for the recipe! Yay!! Glad you enjoyed Sandy. thanks for this idea…brewing coffee right now for my cubes! Just wondering- for the mocha- did you use just plain cocoa powder, with no sweetener? I don’t see any mention of any other ingredients. Does it blend into the warm milk without lumps? Hey Barbara – I used a sweetened cocoa powder (like a hot chocolate mix) and it blended into the warm milk nice and smooth. OMG this looks so good can’t wait for my sister to visit so I can knock her socks off! We both love our coffee and I just recently move to Airzona (110 degrees most day) and have switch to drinking ice coffee all the time. I will always have 2 ice cube trays in the freeze. Thank you for a wonderful treat Todd. I am 100% doing this! Great idea! Thanks Teresa. Hope you try it out. This looks AMAZING!! Where in the world can I find those metal straws?!?! LOVE those cubes. I need to try this. I think from now on, I’m going to keep an ice tray in my freezer full of coffee ice cubes. Why this never occurred to me before, I’m not sure… but it sure is smart! Mmm, this looks delicious, I’ve never had this one before so I’m definitely making it! Aww, thanks Kristina. Give it a try and let me know what you think! This looks AMAZING. I only wish we were getting a bit more sunshine in England to enjoy some cooling drinks! This looks so good. I love the smell of coffee and the taste, but I don’t drink it because it doesn’t make me feel good. Wishing that wasn’t the case here. This looks like a coffee drinkers dream.